It’s not like we are hurting for books on the Trinity. There was a time when the subject was covered rarely and, often, poorly. Today, though, we have a host of excellent options. This is a good thing, of course. No doctrine is more unique to Christianity or more central to Christian faith and worship. But for a new book to stand out, it needs to be good—really good. It needs to offer something unique. Fred Sanders’ The Deep Things of God is just such a book and easily becomes one of my favorite books on the Trinity. I have long observed that books on the Trinity make the best and the worst of Christian books. The boring ones simply teach facts—facts from the Bible, facts from ancient church history, facts from the dawn of liberalism, almost as if understanding the Trinity was a project that leads to some kind of Christian maturity. “What goes wrong in so much popular discussion of the Trinity is that Christians approach the doctrine as if it were their job to construct it from bits and pieces of verses, arguments, and analogies. The doctrine itself seems to lie on the far side of a mental project. If the project is successful, they will achieve the doctrine of the Trinity…” The beautiful ones teach facts, but wrap those facts in worship and wonder. They do not simply teach the who’s and what’s of the Trinity, but they draw the reader to the persons and work of the godhead. It makes all the difference. Sanders’ joy and delight in the Trinity is evident on every page and it is powerfully contagious. The book begins with this focus on the gospel, and there is no better place to begin. “The first step on the way to the heart of the Trinitarian mystery is to recognize that as Christians we find ourselves already deeply involved in the triune life and need only to reflect rightly on that present reality. Most evangelical Christians don’t need to be talked into the Trinitarian theory; they need to be shown that they are immersed in the Trinitarian reality.” Only after mining the depths of the Trinitarian gospel—what God does—does Sanders begin to explore the questions related to who God is. Who is this God who graciously saves those who have rebelled against him? Has he always been this way? Who and what was he before he had people to save? What does the gospel reveal of his essential nature? “When we praise God for being our creator and redeemer, we are praising him for what he does. But behind what God does is the greater glory of who he is: behind his act is his being.” God is praiseworthy in both regards, for what he does and who he is. 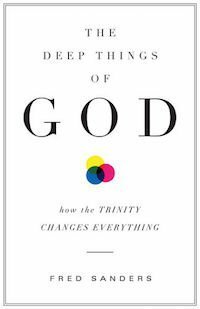 Of all the books I have read on the subject of the Trinity, The Deep Things of God is among the most intellectually challenging, at least on this side of books written by and for academics. It is also one of the most rewarding. Sanders does what he promises and probes deep, deep into God’s revelation of himself. The deeper he goes, the more he exposes the reader to the awe and wonder of our God. This may not be an ideal first book on the Trinity, but it is certainly one that will benefit anyone who wishes to go deeper into this beautiful mystery. It would make an ideal follow-up, for example, to Michael Reeve’s Delighting in the Trinity or Bruce Ware’s Father, Son, and Holy Spirit. As much as Sanders’ topic and book are complicated—the unity and diversity of a God who is one yet three—the heart of the book is answers to three simple questions about the doctrine of the Trinity: Is it biblical? Does it make sense? And does it matter? The clear conclusion is that it is, indeed, biblical. It does, indeed, make sense. And it matters so, so much for us as individuals and us as Christ’s church. The Deep Things of God both explains and proves how the Trinity changes everything.